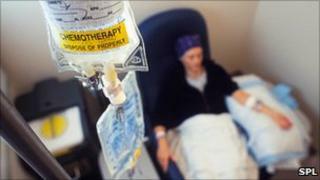 A cancer charity is calling for a major overhaul of care in Wales, warning the number of patients is set to double within 20 years. Macmillan said the current system is "ill-equipped" and that a new cancer plan is needed for the Welsh NHS. With nearly £360m spent on cancer in Wales each year, the report warns that existing standards drawn up in 2005 are not ambitious enough. The assembly government said it had met the charity to discuss care. Macmillan said that with the 120,000 people in Wales living with or beyond the disease set to double in 20 years, a financial and moral need to reform is being created. It has called for a clear strategy to improve assessment and care, suggesting that improving the coordination of care could free up to 10% of NHS budget for cancer patients. The charity cites the case of Emma Woozley, 32, from Swansea, who was diagnosed with a rare type of lymphoma in September 2009. Her treatment began as University Hospital of Wales in Cardiff, where she was had a specialist nurse. But when the former MoD police officer was transferred to Swansea, she did not have access to a lymphoma nurse, the report claims. Ms Woozley said: "I had a direct line through to the lymphoma nurse when I was in Cardiff, whereas in Swansea there is no lymphoma specialist nurse. "So I'd speak to whoever could take the call and not always someone who was involved with my treatment. "This would be frustrating not only for me but also the person taking the call as they wouldn't always be able to answer my query because they wouldn't know my history." The Macmillan report said that without adequate support, people left alone to deal with the side-effects of their cancer or treatment can lead to a further drain on the NHS and other public services. Cath Lindley, general manager for Macmillan Cancer Support in Wales, said: "The present system is ill-equipped to deal with the growing number of people needing help. "At the same time, services aren't keeping up with the changing nature of cancer and people's ongoing needs. That is why we need to rethink how we approach cancer care in Wales." In response, the assembly government said the charity's report would "help inform" the development of its strategic plan for cancer for the next four years. A spokesperson said: "With one-in-three people diagnosed with cancer at some stage in their lives, investment in caring for people with cancer and measures to reduce the incidence of cancer has, and will continue to be, a priority for the Welsh Assembly Government. "The NHS in Wales is expected to plan and deliver patient-centred services, including cancer services, that meet the needs of the individual."